A new study by Queen’s scientists and an international team of researchers has found that tiger sharks, a potentially dangerous species for swimmers, are most active and most abundant in coastal waters of around 22°C. Second only to the great white in recorded attacks on humans, tiger sharks are found primarily in tropical and temperate waters, especially around central Pacific islands. A solitary, generally nocturnal hunter its name derives from the dark stripes down its body, which resemble a tiger's pattern but fade as the shark matures. Understanding how temperature impacts on where tiger sharks are likely to be found has clear implications for the number of human encounters with this hugely dangerous species, which has a notorious reputation for eating anything. 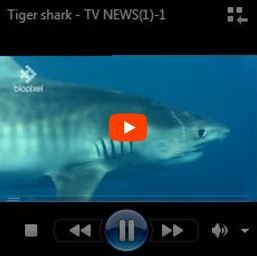 In the study, led by Dr Nicholas Payne, a visiting researcher at Queen’s and an academic at the Department of Life Sciences at the University of Roehampton, researchers attached accelerometers – small tags resembling Fitbits – to tiger sharks off Hawaii to monitor their swimming activity levels. They then analysed decades of records on catch rates of the species spanning Australia’s eastern coastline. Dr Payne said the study is important for both the ecology of the species and management. He commented: “How we manage risks associated with potentially dangerous shark species is a difficult issue for authorities. Dr Jonathan Houghton from the School of Biological Sciences at Queen’s University Belfast was a key scientist on the research project, the findings from which were published this week in the journal Global Change Biology. Photo credits: Global Change Biology (headline) Global Change Biology website; Richard Fitzpatrick (main); Video credit: TV NEWS(1).